UDM Downloads > Network Info Requester! 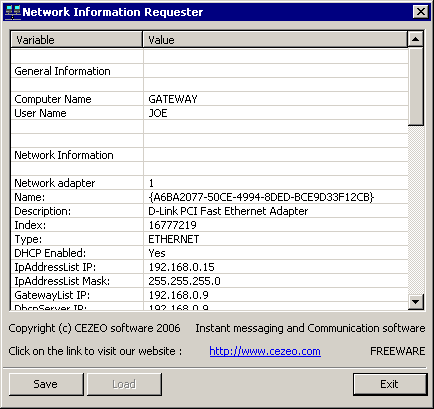 Network Information Requester is very simple utility. You need to launch it and all information will be collected automaticly, without any attention. It takes about a second to collect the information about network settings for the each installed network adapter. Also you able the save this information to the HTML file. It's a very handy when you need to troubleshoot network settings or find a problem at remote computer. You able to collect: Computer name. User name. Network adapter type. Network card ID. Network card name and description. DHCP settings. Network card IP address. Network card mask. DHCP server IP. The time when DHCP settings arrived and expires. Gateway IP. WINS settings. Primary WINS server IP. Secondary WINS server IP.